01. Qualified member for MDRT (Million Dollar Round Table) Conference U.S.A. for two consecutive years. 02. Qualified as a GOLD MEMBER for AMP SANMAR Life Insurance Co. Ltd. And Relaince Life Insurance Co. Ltd.
03. 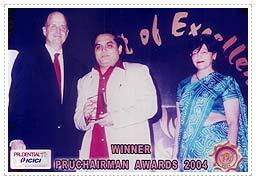 Pru-Chairman GOLD AWARD winner for three consecutive years (2003-2004-2005). Won CHAMPION Award for year 2007-2008. 04. Travelled to Athens-GREECE for special training on motivation & inspiration on behalf of ICICI Prudential Life Insurance Co. Ltd. conducted by Rahul Dravid. 05. Visited AUSTRALIA for Special Training on Mutual Funds on behalf of Pru-ICICI. 06. Visited DUBAI for Training on Mutual Fund by Uma Sashikant on Mutual Fund Sales. 07. Visited THAILAND on behalf of Prudential ICICI. 08. Visited NEW ZEALAND to participate in Annual Conference of AMP Insurance on behalf of AMP SANMAR Life Insurance Co. Ltd.
09. 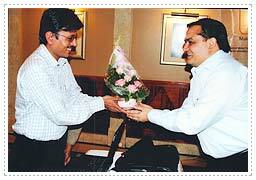 Attended Special training on following – Debt Market – Uma Shashikant, Sales Performance – Dr. Pramod Batra. 10. 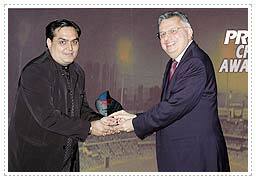 Won UPPER CRUST AWARD from HDFC Mutual Fund. 11. Attended Special sales conference in South Africa on behalf of Relaince Life Insurance Co. Ltd.
12. Nominated by CNBC – TV18 for Financial Advisory Awards – 2006. 13. Attended Special sales conference in South Africa on behalf of Franklin Templeton Mutual Fund. 14. Attended Special sales conference in Russia on behalf of Reliance Life Insurance Co. Ltd.
RAM BARCHHA BEING AWARDED BY RESPECTED MRS. KALPANA MONPARIA (DY. M.D. 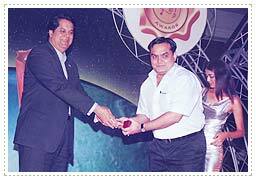 ICICI BANK) FOR PRU CHAIRMAN AWARDS - 2004. WELCOMES CIO - MR. NILESH SHAH OF ICICI PRUDENTIAL AMC LTD.
SHRI K. V. KAMAT (MD & CEO ICICI BANK) ON OCCASSION OF PRESENTING GOLD TROPHY. PRU CHAIRMAN CHAMPION TROPHY AWARDED BY SHRI K. B. DADISETH TRUSTEE - ICICI PRUDENTIAL AMC LTD.
© VikalpFinvest.com, 2008. All Rights Reserved.